Hamas leader Haniyeh's niece suffers injuries while rioting, Gazan explosive device kills 22-year-old rioter. 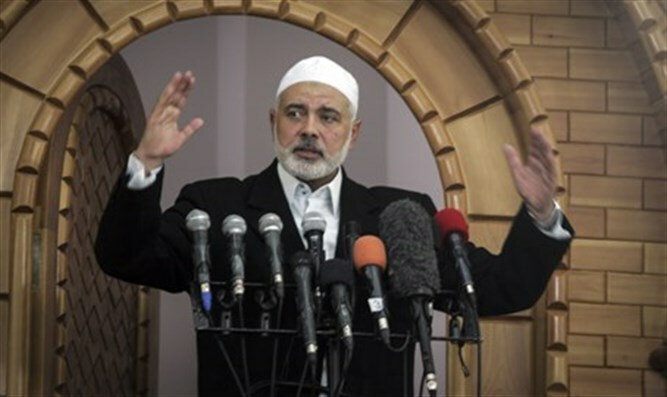 Hamas leader Ismail Haniyeh's niece was severely injured while participating in a violent Gaza border riot on Friday. The niece, 38, is currently being treated at Gaza's Al-Shifa Hospital. During the protests, Gaza rioters threw an explosive device at nearby IDF soldiers. The device exploded within Gaza, injuring several Gazans. However, none of the soldiers were injured. The IDF noted that a 22-year-old rioter killed during the riots met his end after a fellow Gazan rioter threw an explosive device in his direction, near the Karni crossing.